This fish was extremely light and juicy. I usually sear my salmon and bake it but I think I may change my salmon ways. Baking/poaching the salmon really makes it very tender and soft. Instead of using just foil paper I placed parchment on top of the foil and wrapped the salmon. 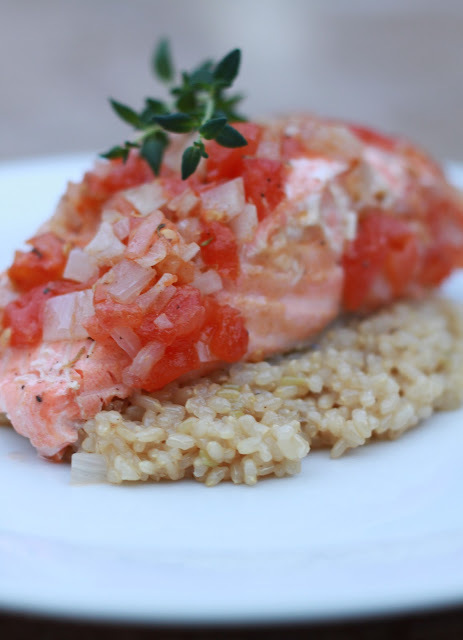 The salmon is very mild and I would suggest rubbing the salmon with minced garlic, subtracting the 1tsp oregano for 1/2 tsp, use 1Tb fresh thyme instead of dried and add extra spices to entice your taste buds! Rub the salmon with olive oil and sprinkle with salt and pepper. Stir 2 cups chicken stock with 1 cup brown rice in a pot, bring to a boil then simmer covered for about 45 mins, stirring occasionally. In a medium bowl stir the tomatoes, shallots, 2 Tb olive oil, lemon, oregano, thyme, salt, pepper, and extra spices. Place salmon fillet skin side down on the parchment and foil paper spoon the tomato mixture on top of the salmon to completely cover the fish and seal the packet close. Repeat with the remaining salmon fillets. Place the wrapped salmon fillets on a baking sheet and bake for about 25 minutes, or until cooked thoroughly. Scoop the brown rice on a plate and place the salmon fillet on top of the rice. Spoon the sauce over the salmon and serve.